Lately I’ve been experimenting with caned veneers, mostly for covering eggs. I’ve experimented with the scale and intricacy of the cane, the amount of light/dark contrast, the shapes of the components and various color combinations. I’ve buffed some to a high gloss and left others with a soft matte finish. 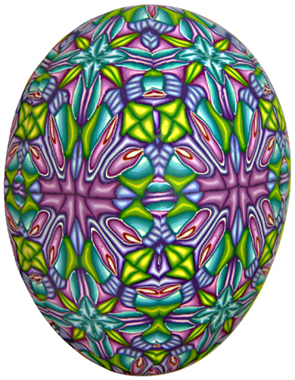 I’ve focused on eggs because I enjoy the challenge of covering an ovoid form with square cane slices, but veneers can be used to create patterned designs on objects of all kinds. Patterned wood veneers have been used for decorative purposes throughout history. The earliest examples were found in Egyptian tombs more than 4,000 years old. Not long ago, I watched a short video on Japanese puzzle box construction. The artist fit blocks of different kinds of wood together to form simple geometric patterns when viewed from the top. 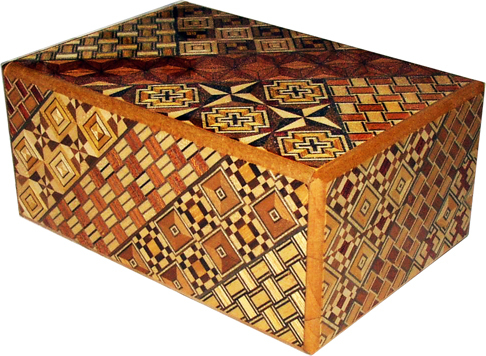 He glued them together then took very thin slices off the tops of several different blocks and combined them in various ways to make to make new, more complex designs such as the designs on this puzzle box. In essence, this is a “shortcut” method of doing parquetry, the fitting together of geometric pieces of wood veneer to create a surface design. I was struck by its similarity to caning. Of course veneers are used all the time by polymer clayers. Whenever we apply a slice or sheet of decorative clay over scrap clay, we are creating a veneer. 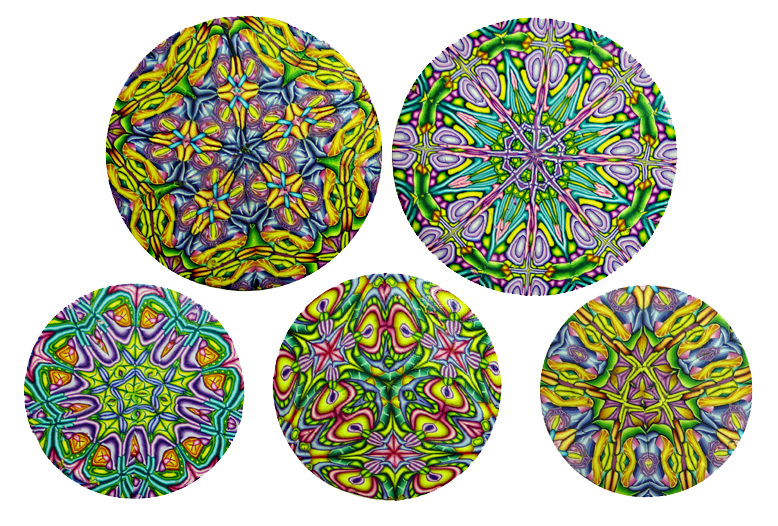 My kaleidoscope pendants, for example, are caned veneers on top of scrap clay. I began to think about using the same canes I had been using on eggs to create geometric veneers along the lines of parquetry. I began cutting and recombining the cane slices to create linear patterned veneers. On the right is my first set of veneers; it is from the cane I used on the egg on the upper left of this page. 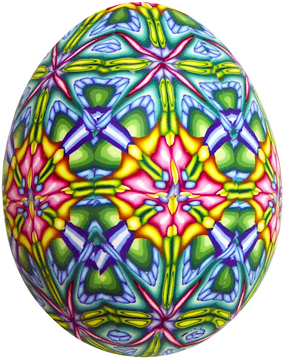 I’ve become a bit obsessed with creating the patterns and have not progressed to applying the veneers to any objects other than eggs; however, the possibilities are endless. See, for example, Cynthia Tinapple’s work on Polymer Clay Daily. 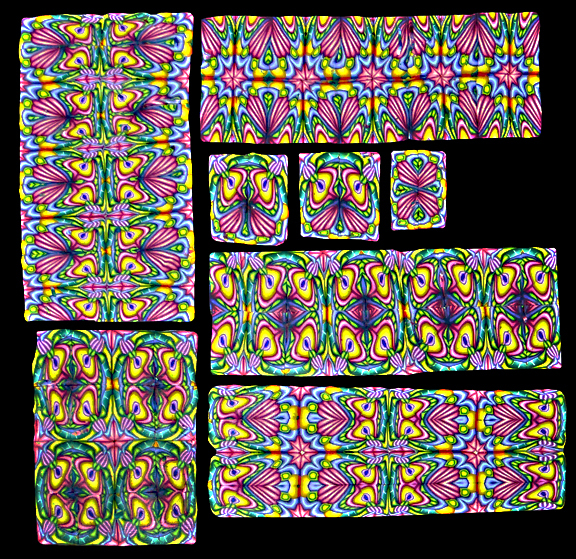 My cane slicer has simplified the process of producing patterned veneers, whether for eggs or anything else, because it allows blocks of of clay to be combined into patterns then recombined with other patterned blocks of clay to produce more complex patterns which can then be slice into very thin sheets of uniform thickness. 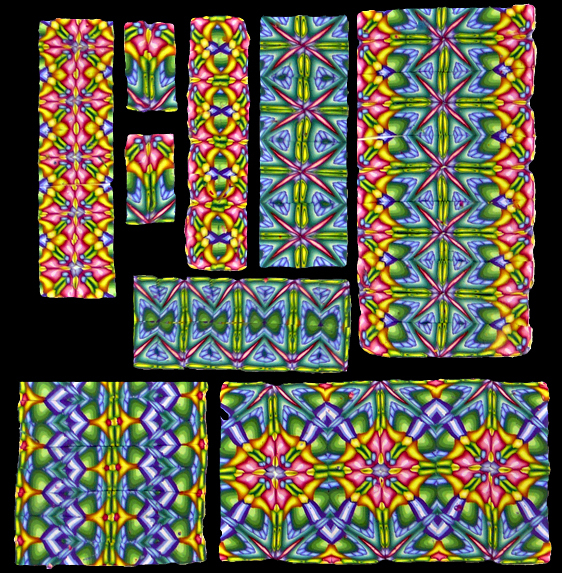 These sheets could even be cut and recombined into more complex designs, as with the Japanese puzzle boxes, or even used to make radial veneers (circular kaleidoscopes) as shown below. 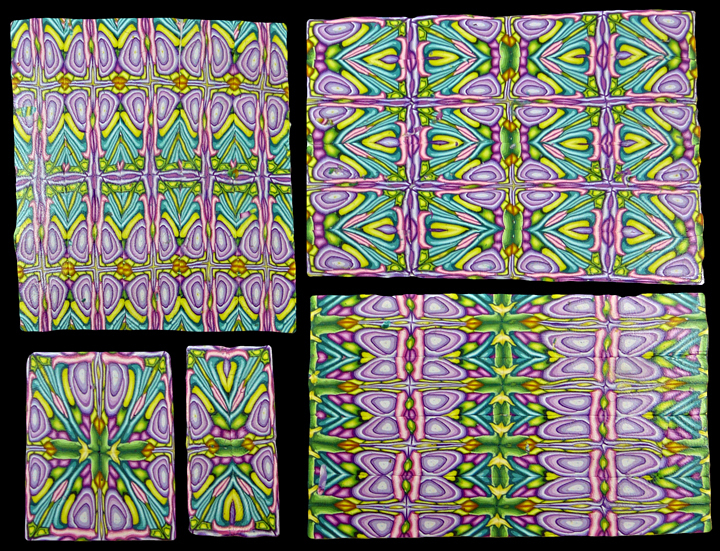 This discovery has been incorporated into my Tessellated Kaleidoscope Cane Veneers workshop. Now participants can choose to veneer boxes, pendants, bowls, and a variety of other objects as well as eggs with their leftover veneers. 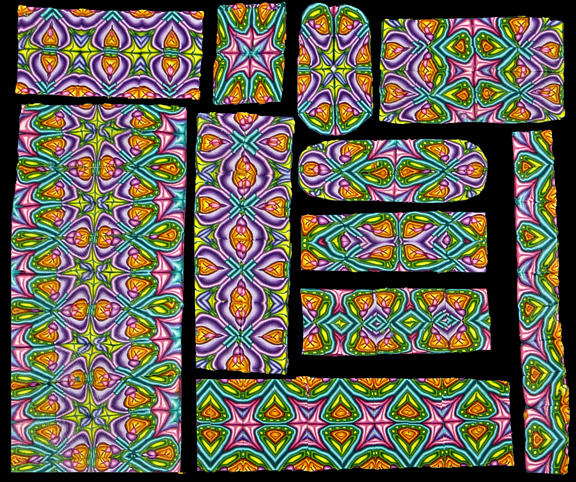 This entry was posted in Cane Slicer, Caning, Classes/Workshops, Kaleidoscopes, Sources of Inspiration, Teaching and tagged Carol Simmons, Color, Color Mixing, Kaleidoscope Canes, polymer clay, Polymer Clay Classes, Polymer Clay Colorado, Polymer Clay Teachers, Polymer Clay Techniques, Polymer Clay Workshops. Bookmark the permalink. Thank you, Melanie. These new veneers are really fun to do. I hand a difficult time tearing myself away from my clay table to write this post. This looks very interesting. Will you be incorporating any of it into the workshop in August? I’m really looking forward to attending the workshop! A bit of it will be included, but it is actually part of a different workshop. Okay Carol, these are “crazy awesome”! I can only drool. Thank you Paula. Miss you. hi carol….i’ve been popping in every couple weeks for about a year thinking i would eventually see a link to an online shop, or a list of galleries that carry your work….as far as i can tell, nothing!!! am i missing something? i would love to see what you have available….can you direct me to a source for purchasing your work? I’m not selling right now. I sold out everything I had on my last guest artist trip. I’ve spent most of my time over the past year developing new techniques for classes, testing them out on local students and making class samples. I keep thinking I’ll start making things for sale again, but the truth is that I’m not very motivated when it comes to production. Carol it would be fun to collaborate on something. thanks so much for your kind words…i totally sympathize (though i must admit to some serious disappointment) with how you feel about production. most of what i make is just for the sheer joy of MAKING….i’m not a “seller” at heart. your work is exquisite and wholly inspirational…i don’t love polymer clay in general (because i have struggled with it so much myself, i think i’m mostly mad at it) but i adore your work with it. maybe someday i’ll be able to escape from connecticut and my full-time job and take a class with you! thanks for blogging! i’ll still be watching what you’re doing! I am going to be selling some eggs before long. I’m making so many in my quest to find the best way to do them (for students). I’ll keep you posted if you like. oh yes, oh yes!!!! i love your jewelry, but right now i’m MOST interested in the eggs! thanks so much, i look forward to hearing from you!!!! Oh–your class will be even better than I imagined. I’m SO looking forward to it! Priscilla, I’m glad you are excited. I’m really glad you were able to work it out so you can come. Everybodie’s looking forward to attending classes!! I live in Germany, my bus doesn’t go to Colorado. A videomasterclass on DVD?? I’m doing a teaching tour in Europe in Sept 2012. I’ll be teaching in Europe in 2012. This is just wonderful!! Where would it be possible to find the info about your tour? Could you please place it in the Facebook? I will be posting information both here and in facebook. I also put you on my mailing list. Do you plan on releasing a DVD or book for those of us who can’t travel to where you are teaching? Your work is amazing, exquisite and absolutely beautiful! For the next couple years I’m going to focus on teaching. After that there is a good possibility of a DVD. BTW, I’ll be teaching in Racine, WI in June, 2012. Wow! It would be great to attend – I’ll get the specifics.